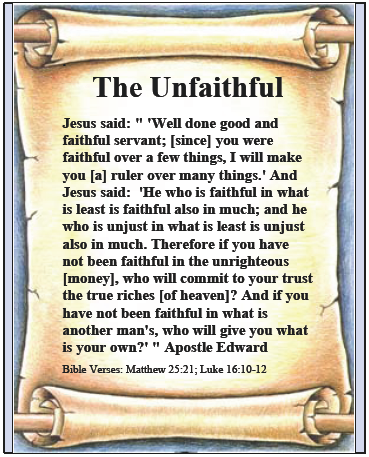 Apostle Edward | The Unfaithful | The Unfaithful Cover Page - Jesus Taught Us To Be Faithful. 1. Faithful over a few things. 2. Faithful in the least of things. 3. Faithful in simple things. 4. Faithful in the use of money. 5. Faithful in what belongs to another. You might think that this is easy to do, but it is not if you are not guided by the Spirit of God. Putting off the old man and putting on the new man and learning to walk in the Spirit is what you need to do to accomplish this. It is God's Spirit that gives you the strength to walk by His ways and not man's. Jesus also taught us to be faithful until our death if we want to receive a crown of life. When Jesus taught us to be faithful until our own death, it was with the knowledge that many of us [if not most believers] would experience severe testing, tribulation, and/or maybe even torture. So, the question becomes, will you die for your faith? If not, you do not have the kind of faith that God requires. And, you may not be faithful in the smallest of things. If this is you, it is cheap grace that you have. "Cheap grace is the deadly enemy of our Church. We are fighting today for costly grace. Cheap grace means grace sold on the market like cheapjacks’ wares. [Cheapjacks were sellers of inferior or cheapened goods]. Cheap grace means grace as a doctrine, a principle, [or] a system." "It means forgiveness of sins proclaimed as a general truth, the love of God taught as the Christian conception of God. An intellectual assent to that idea is held to be [in and] of itself sufficient to secure remission of sins. Cheap grace means the justification of sin without the justification of the sinner. Grace alone does everything they say, and so everything can remain as it was before. 'All for sin could not atone.' Well, then, let the Christian live like the rest of the world, let him model himself on the world’s standards in every sphere of life, and not presumptuously aspire to live a different life under grace from his old life under sin...."
"Costly grace is the treasure hidden in the field; for the sake of it a man will gladly go and sell all that he has. It is the pearl of great price to buy which the merchant will sell all his goods. It is the kingly rule of Christ, for whose sake a man will pluck out [his] eye [if it] causes him to stumble [sin], it is the call of Jesus Christ at which the disciple leaves his nets and follows him." "Costly grace is the gospel which must be sought again and again and again, the gift which must be asked for, the door at which a man must knock. Such grace is costly because it calls us to follow, and it is grace because it calls us to follow Jesus Christ. It is costly because it costs a man his life, and it is grace because it gives a man the only true life. It is costly because it condemns sin, and grace because it justifies the sinner. Above all, it is costly because it cost God the life of his Son: 'ye were bought at a price,' and what has cost God much cannot be cheap for us. Above all, it is grace because God did not reckon his [human] Son too dear a price to pay for our life, but delivered him up for us. Costly grace is the incarnation of [the Word of God through the human flesh of His only begotten Son Jesus Christ]." "Costly grace is the sanctuary of God; it has to be protected from the world, and not thrown to the dogs. It is therefore the living word, the Word of God, which He speaks as it pleases Him. Costly grace confronts us as a gracious call to follow Jesus. It comes as a word of forgiveness to the broken spirit and the contrite heart. Grace is costly because it compels a man to submit [himself] to the yoke of Christ and follow him; it is grace because Jesus says: 'My yoke is easy and my burden is light.' "
"On two separate occasions Peter received the call [from Jesus]: 'Follow me.' It was the first and last word Jesus spoke to his disciple (Mark 1:17; John 21:22). A whole life lies between these two calls. The first occasion was by the lake of Gennesareth, [Sea of Galilee] when Peter left his nets and his craft and followed Jesus at his word. The second occasion is when the Risen Lord [Jesus] finds [Peter] back again at his old trade." Peter received the costly grace! The above discussion on cheap grace and costly grace are from Dietrich Bonhoeffer's book titled The Cost of Discipleship. This discussion is on the Internet at http://www. crossroad.to/Persecution/Bonhoffer.html. Bracketed numbers are pages in his book. Dietrich Bonhoeffer suffered death at the hands of the Nazis during World War II. Before dying for his faith, he came to the spiritual conclusion that unless one was willing to die for his or her faith, then that faith was based on cheap grace and would be found lacking before God. Verily I say unto you, such a faith is no faith at all! "The life of the spirit is not that which shuns death and keeps clear of destruction: rather it endures death and in death it is sustained. "In a modern dictatorship, however, with its subterranean ubiquity and all-embracing instruments of oppression, a revolt means certain death to all who support it. ... The future in modern society depends much more on the quiet heroism of the very few who are inspired by God. These few will greatly enjoy the divine inspiration and will be prepared to stand for the dignity of man and true freedom and to keep the law of God, even if it means martyrdom or death." Verily I say to you that the "whole Church" also lies under the sway of the wicked one! "Do not be unequally yoked together with unbelievers. For what fellowship has righteousness with lawlessness? And what communion has light with darkness? And what accord has Christ with Belial [the devil]? Or what part has a believer with an unbeliever? And what agreement has the temple of God with idols? For you are the temple of the living God. As God has said: 'I will dwell in them and walk among them. I will be their God, and they shall be My people.' "
The above spiritual truths are different than what most churches teach. Sincere faith in God and His Son Jesus does come with a cost attached. In exchange for sincere faith, we obtain eternal life after our short earthly journey ends. The true believer sees him or her self in the context of heaven. This allows them to become steadfast even in the face of earthly persecution. Their spirits know they are of God and do not belong to the world. Many New Testament letters are addressed "to the faithful" or to "those who are sincere in the faith" or to "like minded believers." If you have not accepted God's costly grace, your faith will not be sincere. It's because you will not have the strength and courage that only comes from a true conviction. The letters in the Bible are spiritual letters and instructions from God to His children. When you read it with your spirit engaged, you will get what God wants to give you. When you read it with only your mind, you won't get God's message. The process of debasing Christianity, which Bonhoeffer observed in the early 1940s, has continued on since his death. Christianity no longer resembles the Church that Christ sent his apostles out to build. The Church was supposed to be filled with believers who understood the costly nature of grace and who had the strength to be faithful to God. The debasing of the Church has led to the belief by many that their salvation is secure and cannot be lost. Listen to God's Word. "For if we sin willfully after we have received the knowledge of the truth, there no longer remains a sacrifice for sins, but a certain fearful expectation of judgment, and fiery indignation which will devour the adversaries. Anyone who has rejected Moses' law dies without mercy on the testimony of two or three witnesses. Of how much worse punishment, do you suppose, will he be thought worthy who has trampled the Son of God underfoot, counted the blood of the covenant by which he was sanctified a common thing, and insulted the Spirit of grace? For we know Him who said, 'Vengeance is Mine, I will repay,' says the Lord. Yes, your salvation is lost if you continue to willfully sin. To do so, means you are not only lawless in regards to God's Word, you are also unfaithful to His Word. Same thing! For now, you need to understand that both God and His Son Jesus Christ fully expect you to be faithful to their instructions. This does not mean you will be perfect. It means you fully grasp the issues of cheap grace, costly grace and that of a true conviction. In John 15:22, Jesus states we have no excuse for our willful sin. Note: there is unknown sin and also unintentional sin that are covered by Jesus' blood. See the Book of Edward for a complete discussion of sin. In 1 John 3:4, we learn that sin is defined as lawlessness. It means we are disobedient and is another way of stating unfaithfulness. In Matthew 7:23, we learn that Jesus rejects all who call on his name who are lawless. Those who are called lawless are simply people who were unfaithful to God. Just what constitutes true belief? Is it being informed on a subject? Having extensive knowledge of a subject? I have done a lot of thinking about this and I have come to the conclusion that knowledge alone does not constitute belief. Further, that the old adage "knowledge is power" is a lie and falsehood. It is applied knowledge that is power. For example, the doctor or nurse who lights up a cigarette to smoke doesn't really believe that smoking is harmful to their health. Do they? Of course not, they have knowledge in their heads about the health problems of smoking, but there is no true belief in their hearts. If there were true belief, they would have no problem stopping smoking. So, it is applied knowledge that contains true power. Only when we have a firm conviction in our souls will we apply the knowledge we know. So, we need to take action on the knowledge we have in order for it to do anything for us. It's the same thing when we accept Jesus as our savior. If we fail to obey his teachings, we fail to activate the spiritual power God has available for us. We also demonstrate to God that our proclaimed faith is a falsehood and that we are insincere towards Him. For if we truly believed, wouldn't we obey God? There are 16 verses in the New King James that use the word "unfaithful" and 86 verses that use the word "faithful." The prior page is only a sampling of them. Yet, clearly God is focused on the positive. So, be faithful to God! Obey His Word and the teachings of His Son and you will see His eternal life. God asked me to write seven street tracts for Him and this is the seventh. Yet, when I look back, He has had me writing about how the Church at large has become unfaithful to Him in all the tracts He called me to write. In tract one, The Invitation, God had me show you Scripture that showed how the Church has lied about the nature of His salvation. Even denying His Word that salvation comes from Him. Is salvation a small matter of faithfulness? In tract two, The Messenger, God had me show you Scripture that showed how the Church has lied about the nature of Jesus Christ, God's only human begotten Son. Even denying His Word that Christ is not God. Is this a small matter of faithfulness? In tract three, The Unfaithful, God had me show you Scripture that showed how the Church has failed to open the minds and hearts of people. Even denying His Word that salvation is deeper than mouthing Jesus. Is this a small matter of faithfulness? In tract four, Law of Christ, God had me show you Scripture that showed how the Church has lied about the nature of God's Law and what Christ has done in terms of increasing His standard for our behavior. Even denying His Word that the Law has not entirely been done away with. Is this a small matter of faithfulness? In tract five, The Seven Spirits, God had me show you Scripture that showed how the Church has lied about the nature of God Himself through the invention of a pagan god called the Trinity. Even denying His Word that God has seven spirits and not just one. Is this a small matter of faithfulness? In tract six, The Tithe Lie, God had me show you Scripture that showed how the Church has lied about the nature of tithing in the Old Testament. Even denying His Word that tithing is of the law and no longer required. Is raising money through a false doctrine on tithing a small matter of faithfulness? In this tract, The Unfaithful, God had me show you Scripture that showed how the Church has lied about being faithful and now has a cheap grace doctrine that leads many to Hell. Even denying His Word that faithfulness is a requirement of salvation. Is this a small matter of faithfulness? The contrast is astonishing. Christ has taught us to be faithful even in small things. Yet Orthodox Church doctrines are unfaithful in very huge things, leading believers astray and keeping them out of God's kingdom. Therefore, orthodoxy has resulted in corrupt religious institutions just like the one Jesus castigated the scribes and Pharisees about. The Church keeps people out of heaven and most churches are now as unfaithful to God as the first institution Christ reprimanded. There are Two Heart Gateways to get to God Almighty. Jesus is only one way.